I'm very happy to be able to tell you that my friend Gaz Gretsky is also a part of our Shadows of Oz Tarot Deck*. 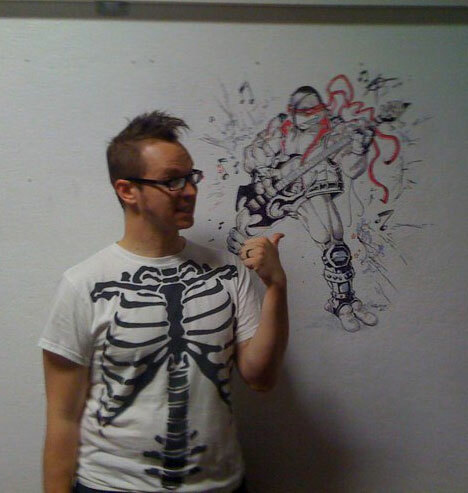 Gary “Gaz” Gretsky specializes in Caricatures, Comic Books, Illustration, and Animation. His work ranges from CD Covers for a local bands to Spring Break commercials for MTV, to the animated Nickelodeon show Pinky Dinky Doo. Gaz, and his wonderful wife Quelyn, their cats and toys all live in in the Bay Area. This is Gaz posing in a very blurry photo (my fault) of an amazing Teenage Mutant Turtle he created on the wall at Illusive Comics & Games that gets endless compliments. Gaz joins RAY SNYDER, KORI THOMPSON, JIMMIE ROBINSON, EMONIC, GILES CRAWFORD, PAUL GULACY, OLYMPIA MAXENCHS, ERIC SHANOWER, DARICK ROBERTSON, STEVE LEIALOHA, TRINA ROBBINS, and BEN TEMPLESMITH on our tarot Project.